Angelfishes or pomacanthids are members of Pomacanthidae family. They are mainly found on the outer coral reefs at depths of 5 to 60 meters. They can be recognized by having deep and highly compressed body, with a strong spine at the preopercle. 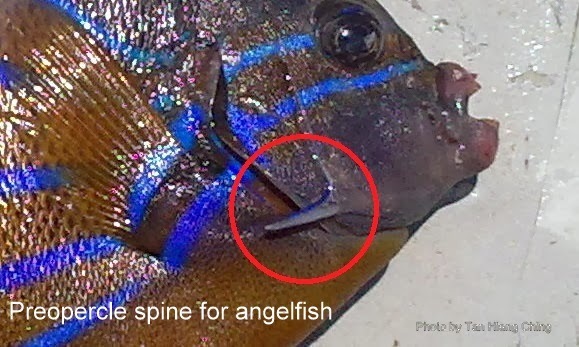 Butterflyfishes which are similar in shape and color to angelfishes do not have this spine. 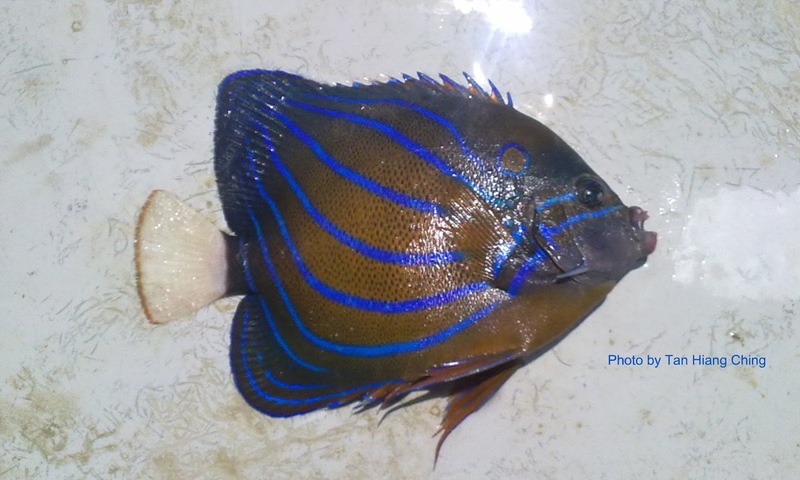 Almost all angelfish species are very brightly coloured with complex and varied colour patterns. They undergo a complete color transformation from the juvenile to adult stage. Angelfishes feed on sponges and other marine invertebrates. They are rarely caught for food. The primary fishery value of angelfishes is through the ornamental marine aquarium trade. There are 8 genera and about 87 species of angelfishes worldwide. Malaysia is represented by 6 genera and about 20 species. Main Diagnostic Features: Brown to yellow in color with distinct curved blue lines on the body. 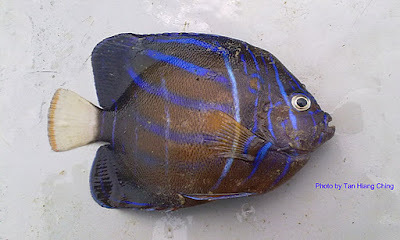 Adult with a blue ring above the gill cover. The caudal fin is white with a yellow margin. Size: Maximum total length 45 cm. Main Diagnostic Features: Adults yellowish tan with 6 distinct dark vertical bars on body and a broad white bar on head behind the eye. The caudal fin dark with blue dots. Juveniles blackish with about 15 curved, narraw blue and white bars on the sides.